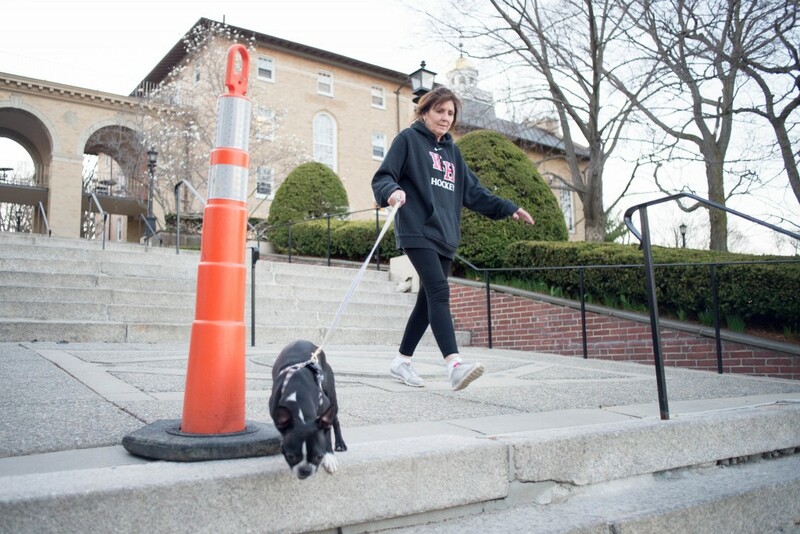 After 15 years, the Tufts Memorial Steps will be replaced again. The project will start in late May and run until the end of November, according to Senior Manager of Project Administration Ray Santangelo. In an email to the Daily, Santangelo confirmed that the heavy snowfall this year in particular has damaged the steps, which are alternatively known as the Memorial Stairs. Timothy Smith, architect of the Memorial Stairs project, said that the existing stairs were last repaired in the summer of 2000. “Since that time, there has been significant movement which has caused the granite and concrete elements of the stair[s] to crack and spall,” he told the Daily in an email. Smith further explained that the movement is caused by large quantities of surface and subsurface water moving off the hill. “The existing drains that serve the stairs are plugged, broken and are of no use, but were probably insufficient from the beginning,” he said. Both Santangelo and Smith noted that the soils in the Memorial Steps area are very dense glacial till, which absorbs little or no water. They explained that when movement occurs and water infiltrates different parts of the stairs, the brick cheek walls on each side of the steps deteriorate. According to Smith, this deterioration is amplified by the original construction, which placed granite treads below the brick walls. “Whenever the granite stairs moved upward with frost action in the soil below, it has caused the brick walls to crack and lose bond,” he said. Santangelo described the granite steps as bearing directly on soil that is precariously supported on scraps of brick on top of narrow concrete carriage walls at the end of each piece of granite. “As the water moves on top of the soil below and washes it away, some of the granite supports have failed, and many are at risk,” he said. Gresh Lattimore (F ’70), chair of the Advocates for Tufts Reserve Officers’ Training Corps (ROTC), highlighted the historic significance of the Memorial Steps. “The steps are in keeping with the Tufts tradition of providing young officers at time of war,” Lattimore said. As a Fletcher School alumnus, he recalled that he had no particular affiliation with the steps while he was studying, until he returned back after serving as a Navy officer in the Vietnam War. Lattimore expressed contentment over the replacement of the deteriorating steps, explaining that their preservation is historically important for Tufts. “Every Veteran’s Day — that’s when World War I ended — on the 11th hour of the 11th day of the 11th month, a flag passing ceremony takes place over the Tufts Memorial Steps,” Lattimore said. According to Lattimore, the annual ceremony has been practiced since the mid-1950s. The Memorial steps thus represent a way for Tufts to honor and serve the military forces, Lattimore explained. According to Santangelo, the new stairs will look similar to how they currently look, with the exception of colored trim granite around the memorial areas. “The memorial information will be laser engraved and back painted, because the existing bronze letters are deteriorating and causing the adjacent materials to crack,” he said. Kimberly Thurler, director of public relations, commended the replacement of the steps, saying that since they are heavily used, all students, faculty, staff and visitors will benefit from the project. “The Memorial Steps are a distinctive landmark at Tufts and a focal point for that part of our campus,” she told the Daily in an email.